As I've noted before, I have a strange weakness for many of the stories H.P. Lovecraft "revised" (i.e. ghostwrote) for other authors. I'm not entirely sure why that is, because, when viewed objectively, these stories usually aren't as well-constructed as HPL's own tales. 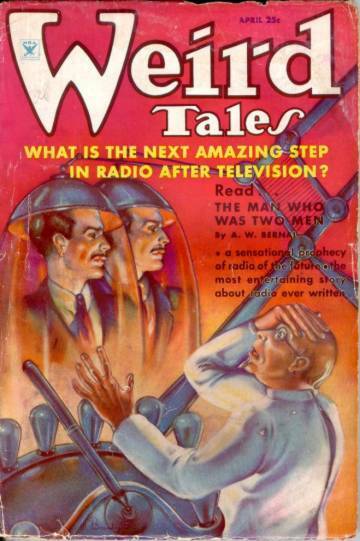 Some are downright shlocky, even by the fairly low standards of the pulps. Yet, there's still something compelling about them that brings me back to them time and again. One has to admit that's a pretty good opening to a story! It's certainly lurid, much like the story that follows, but it does nicely set the scene and draw one in. Dr. Johnson explains that, in 1878, a freighter from New Zealand "sighted a new island unmarked on any chart and evidently of volcanic origin." A landing party under its captain discovered "prehistoric Cyclopean masonry" on the island, including a massive stone crypt. Inside the crypt, the party found the aforementioned mummy, on whose body was found a cylinder of unknown metal containing a scroll of similarly unknown material on which was written some kind of unrecognizable script. The mummy was that of a medium-sized man of unknown race, and was cast in a peculiar crouching posture. The face, half shielded by claw-like hands, had its under jaw thrust far forward, while the shrivelled features bore an expression of fright so hideous that few spectators could view them unmoved. The eyes were closed, with lids clamped down tightly over eyeballs apparently bulging and prominent. Bits of hair and beard remained, and the colour of the whole was a sort of dull neutral grey. In texture the thing was half leathery and half stony, forming an insoluble enigma to those experts who sought to ascertain how it was embalmed. In places bits of its substance were eaten away by time and decay. Rags of some peculiar fabric, with suggestions of unknown designs, still clung to the object. Just what made it so infinitely horrible and repulsive one could hardly say. For one thing, there was a subtle, indefinable sense of limitless antiquity and utter alienage which affected one like a view from the brink of a monstrous abyss of unplumbed blackness—but mostly it was the expression of crazed fear on the puckered, prognathous, half-shielded face. Such a symbol of infinite, inhuman, cosmic fright could not help communicating the emotion to the beholder amidst a disquieting cloud of mystery and vain conjecture. The true nature of this mummy and how it came to be form the bulk of the story, as Dr. Johnson deals with a steady stream of strange characters coming to the Cabot Museum to inquire about it. These dealings lead Johnson to seek out forbidden books, such as Von Junzt's Nameless Cults, where he slowly pieces together disparate bits clues to attain what he thinks might be the truth -- a truth that is all but confirmed by the conclusion of the story. "Out of the Aeons" is not a good story. It's mostly exposition and much of its feels recycled if you're already deeply immersed in Yog-Sothothery. As he so often did in his revisions, Lovecraft borrowed heavily from his own prior stories, blending some of their details with the bare bones provided by his revision clients. The result is never great literature, but it is often enjoyable, as is the case with "Out of the Aeons." To this day, I will never forget the first time I read the story in high school and the strange feeling that came over me as I kept one step ahead of Dr. Johnson in figuring out the history of the "hellish mummy" in the Cabot Museum. And while that history is absurd, even laughable in some respects, there's nevertheless an element of genuine horror in it that has stuck with me all these years and continues to haunt my imagination. "Out of the Aeons" (particularly section III) is a strong inspiration for my own Carcosa. Along similar lines, I really enjoyed "Under the Pyramids," the story Lovecraft ghost-wrote for Harry Houdini. "It was just really, really horrible, super-horrible, we all thought it was horrible, infinitely horrible, it scared us, it was so horrible, and we didn't know why it was horrible." 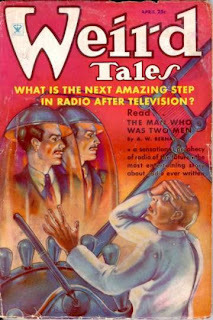 I've always wondered what these stories looked like in their original forms and whether HPL took tales with absolutely no connection to the Mythos and just bolted all that stuff on, to the bemusement of the original authors. Like taking a broad marker to "Uncle Tom's Cabin" and etching in a tale of alien abduction. I strongly felt this with his treatment of Zelia Bishop's 'The Mound.' Loved the story, loved it, but at its core it really seemed only tenuously related to a lot of the wonderful outré nonsense HPL loaded into it. In my mind's eye, I see her mailing her pastiche on Amerind mysticism to HPL for his opinion, and him sending the manuscript back to the bewildered and overwhelmed Zelia with 99% of her stuff crossed out and the bios of Yogsothoth and Yig scribbled in the margins. "Much better now!" Howard scrawls in red on the title page. One thing I find fascinating about the story is the brief mention of a purchase of items found at Faussesflammes in Averoigne, which is of course was the location of a CAS story. Was it just a nod to a friend, or were there ever plans for a story surrounding those items? Also amusing because much like in the Horror in the Museum, we learn that the Cthulhu mythos is not nearly as secret as The Call of Cthulhu would have us believe (either the original story or the later RPG) - in one case, it's all over a museum, in this, in the tabloids.